Staples' Luke Foreman advanced to the State Open final by defeating Ari Cepelewitz, of Greenwich 6-7, 7-6, 7-6 on Tuesday in the semifinals. 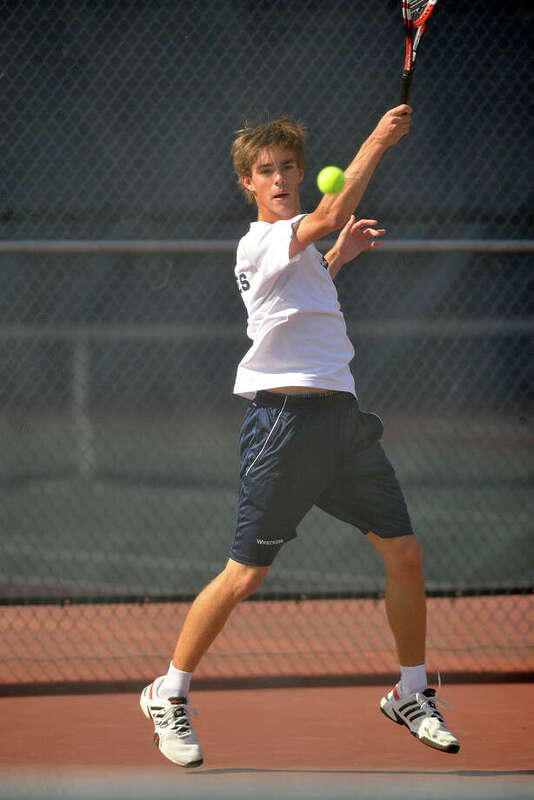 The Staples boys and girls tennis teams will each have a representative in the State Open finals as senior Luke Foreman and the doubles team of senior Kelsey Shockey and freshman Vanessa Mauricio each pulled out dramatic three-set victories in the semifinal round at Yale University on Tuesday afternoon. The finals are set for 3 p.m. on Wednesday at the same site. Foreman defeated Ari Cepelewicz, of Greenwich, 6-7 (5), 7-6 (5), 7-6 (2) in a three-and-a-half hour marathon match that Foreman described as the longest of his career. "It's an amazing feeling," Foreman said. "Especially to beat a playing like Ari, who beat me pretty bad earlier in the season (6-4, 6-1 in the FCIAC semifinals). It was really hot out, so I knew I just had to hang in there. It's a great accomplishment; probably the best match I've ever played." The Cinderella run for seventh-seeded Shockey and Mauricio continued as they upset Fairfield Warde seniors Megan and Erin Hines 6-4, 4-6, 7-5. To reach the semis, Shockey and Mauricio defeated Gretchen Ball and Candace Condon, of Ridgefield, 6-3, 4-6, 7-5 and Darien duo Elizabeth Feingold and Erika Gill 6-4, 0-6, 6-3. "It's funny with these girls because they've beaten three teams in this tournament that they've lost to in the last 10 days," Staples girls coach Paco Fabian said. "That's such a tremendous accomplishment; they've fought so hard all year." Foreman said he had never been involved in a match with more than one tiebreaker before Tuesday's win. Foreman and Cepelewicz had played three times over the past two seasons, with each winning one and the third being halted. Foreman trailed 2-1 in the third-set tiebreaker, but reeled off six straight points to clinch a trip to the final. Although Foreman struggled at times with his first serve, it was on point down the stretch. "(The tiebreakers) were crazy; it just makes every point that much more important," Foreman said. "I lost the first tiebreaker on a few unforced errors. I knew when I got to the second set, I would have to come up with a different game plan and just stay strong throughout." In the final, Foreman will meet Xavier sophomore Richard Ciamarra. The two squared off in the Class LL quarterfinals June 2 and Ciamarra came away with a three-set win en route to winning the singles title. Leading 5-4 in the final set against the Hines twins, Shockey and Mauricio spurned a chance to serve out the match. The Hines' rallied from 40-30 down in that point to tie up the set, but Shockey and Mauricio comfortably won the next two points to secure the match. "Coming from the Darien match to this, it was a lot different," Mauricio said. "The rallies were a lot shorter (against the Blue Wave); today it was a lot more about patience. There were long points." With the win, Shockey and Mauricio will face Wilton's Kaitlyn Zheng and Taylor Ingerman. "I'm so excited," Shockey said. "I won't be able to sleep tonight." The Wreckers doubles team of Baxter Stein and Connor Mitnick had their successful postseason run come to a close as they were defeated by Westhill's Alex Romaine and Prashant Toteja 3-6, 6-2, 6-3. "It was a little bit of a different environment and we didn't have as much energy without the whole team behind us," Stein said. "We still played pretty good tennis, it just wasn't enough." Stein and Mitnick, who weren't paired up until the FCIAC final May 29, went on a tear in the postseason and clinched both the FCIAC and Class LL titles with three-set wins. "It was a great bonding experience," Stein said. "We know we could beat anyone out there; we knew if we were down we could come back. We really worked well together."